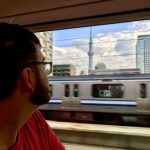 I took a trip to Tokyo in July and thought I’d share some impressions. We stayed in Shiodome, a centrally located neighborhood connected to several subway lines known for its office towers of salary men. Subways are so dense here Shiodome station and Shimbashi station essentially meld into one, connected by multilevel pedestrian streets lined with restaurants and stores, an image hinting at the scale of urbanism Tokyo offers. The first thing that struck me about Tokyo: its transportation system was every bit as efficient as I had heard. We arrived at a time when Seattle would have been ground to a standstill with afternoon rush hour, yet the bus we took from the airport to the hotel didn’t get stuck in traffic. Partially this is a reflection of congestion pricing–the bus used a tollway to reach downtown Tokyo–but also very high transit use and walking rate across its very large metropolitan area. At 3.3 billion passenger trips per year, Tokyo has the busiest metro in the world, and that shows up in its transportation mode share data. One report had Tokyo’s mode share at just 12% private vehicles whereas transit took 51%, walking 23% and biking was 14% of trips. By way of comparison, private vehicles comprised a whopping 88% share in Houston, Texas, as of 2015, whereas Seattle had a 56% share with transit taking 21% for commute trips, according to US Census data. Even in Downtown Seattle, the drive alone rate–though dropping–sits at 30%. Shibuya Crossing is how you do a scramble crosswalk. This isn’t to say that Tokyo doesn’t have traffic; inherently a metropolitan area with a population pushing 40 million will have some traffic congestion and we saw some at various points. However, it seemed clear that people can reliably get around Tokyo thanks to great transit and an enlightened walking culture. The city has planned world class pedestrian infrastructure with sound walls, frequent storefronts, and tons of placemaking. Plus, in places where pedestrians do interact with cars, motorists follow signage, the law, and human decency and yield to pedestrians. Motorists do not block intersections let alone crosswalks. The glass sound walls effectively shielded this elevated walkway from the busy road below. Tokyo is still adding more lines to its already dizzying patchwork of high capacity transit–deciphering a Tokyo metro map takes practice. In 2008, Tokyo Metro finished the Fukutoshin Line, the thirteenth primary line in the Tokyo Metro and Toie Subway systems. Late to the party, it’s also Tokyo’s deepest subway, with an average depth of 27 meters (88 feet). Furthermore, Tokyo is planning upgrades, extensions, and potentially two additional lines citing the development boom associated with the 2020 Olympics. Beyond these 13 primary Metro lines, several other high capacity transit systems operate. One of those is the New Transit Yurikamome line, which takes an elevated route along the waterfront (using rubber-tired wheels on a concrete track) rather than compete with the tangled web of tunnels Tokyo’s subway lines have already mined underground. Riding this line helped inspire my article arguing an elevated line be added to Sound Transit’s plans in order to serve Belltown, First Hill, and the Aurora Avenue corridor. Riding the Yurikamome is also a great way to take in a view of the city around Tokyo bay. Yurikamome New Transit line runs through Shiodome in Tokyo. But then a strange thing happened–at least if you bought that theory–Tokyo’s housing prices have stayed relatively stable compared to the huge price spikes booming American cities have seen during the recovery from the 2008 housing crash. (Recently, Tokyo’s condo prices have surged, which some have argued is linked to Tokyo hosting the 2020 Olympics.) Now the narrative is often: Tokyo builds housing faster than us; thus, it’s solved housing. Tokyo does have some enlightened policies when it comes to housing; the national government sets Japan’s zoning policy, which is much less restrictive than Seattle’s and many other American cities. However, it’s also true that relatively stable prices in Tokyo are linked to Japan’s sluggish economy, stagnant wages, and Tokyo’s population growing more slowly on a percentage basis compared to Seattle. Tokyo is still growing–as it gains population at the expense of other regions–even while Japan’s national population is shrinking due to low birth rates and tight immigration controls (in a country of 127 million, only around 2 million residents are foreign born). Japan’s shrinking population may ultimately play a moderating influence on housing prices, since Japanese homeowners do not have an expectation of an ever growing pool of buyers and thus for home value to steadily accumulate indefinitely. Because of this, homeowners in Tokyo reportedly do not treat housing as an investment like many Americans do; they treat housing as a place to live. Tokyo paired enlightened housing policy with an impressive system of parks and green space even within the downtown core. For example, Hamarikyu Gardens is a short walk across a toll road from Shiodome (granted we got lost a couple times making it a longer walk) and it presented a striking contrast between nature and skyscrapers. The contrast is also between old and new: the park preserves its legacy as a Tokugawa shogunate retreat and later an imperial tea garden where world leaders of centuries past met to conduct diplomacy–now ringed with glass and steel monuments to Japan’s post-imperial progress. Nakajima Tea House at Hamarikyo Gardens with Shiodome skyscapers in the background. Ueno Park (in the title photo) also offers a contrast between traditional and modern, nature and cityscape. Ueno Park’s lotus pond, gardens, Buddhist temples, and shrines offer a respite from the bustling city. Big parks aside, the streets and alleys themselves do their duty to add to Tokyo’s green space. Many are lined with bushes, flowers and trees, even when the space to work with is quite limited. Although Tokyo, to my knowledge, does not have a fancy word like woonerf, the idea of people streets is alive and on display all over the city, making for pleasant, inviting spaces to walk or bike. Japan’s alleys made me wonder why our streets are so excessively wide in America. Like many Tokyo places, this quiet alley near Ueno Park has a vending machine. Deeper Look: Is Tokyo Not Dense Enough? … Tokyo manages a relatively high density with very few tall buildings. But there are costs that Tokyo bears for its lack of height and downtown density. First and foremost are the high housing prices. Imagine New York City if Midtown and the Upper East and West Sides were still tenement neighborhoods, and everyone living and working above the sixth floor was competing for housing and space in the outer boroughs. Narrow the streets and replace the prewars with postwar buildings, and that’s Tokyo. Empirical data does not seem to suggest the relationship between density and housing cost is nearly as straight-forward as Smith proposes. Densifying provides more housing, but because infill housing tends to be in desirable, high-amenity neighborhoods, it also tends to be expensive. Moreover, high-rses inherently have high construction costs since the switch to steel and reinforced concrete raises materials cost and construction times are longer to construct taller buildings. As a result, high-rises get built where the expected market price per square foot is high enough to justify paying the higher cost per square foot. The NTT Yoyigi Docomo Building is Tokyo’s fourth tallest at 240 meters. One can also see the complicated relationship with density from the demand side; since units on higher floors have better views and more prestige, they also tend to command a higher price than nearly identical units down nearer the ground. Thus, new high-rises are a great solution for meeting demand at the top of the market, and a city like Seattle adding tons of high-paying jobs must worry about that market or see wealthier newcomers or social climbers bid up the rest of the market. Additionally, a higher cost per square foot can still work out well for a middle income household willing to make due with a smaller apartment or condominium in exchange for living in a desirable neighborhood. The trade-offs apparent in using a high-rise-focused strategy suggests there’s something to be said about Tokyo’s approach of a great transit network dispersed across a wide geographic area to serve modest mid-rise and low-lise housing geared toward lower income folks. And when Tokyo builds high-rises, it would seem they tend to be squat towers with big floor plates rather soaring super-talls with super-high engineering and construction costs. Technically, Tokyo has sprawled out to cover more land area than any other metropolitan area in the world. Nonetheless, Tokyo suburbs still have high transit use, unlike American sprawl. If Tokyo is any guide, suburbs can be tamed for transit. Perhaps American suburbs can be reformed to be more walkable, transit-focused places, thus allowing them to take a share of a metropolitan region’s growth without jeopardizing transportation and climate goals. I think one of the biggest differences, especially when it comes to housing values, is that in Japan in general, homes steadily depreciate in value, until they reach a value of $0 within 20-30 years of being built. Effectively, homes in Japan are “disposable” and the land they are built on are the only items of value. It was curious to see the poor levels of maintenance on existing housing stock. It seems that private residences are typically not repainted or reroofed in their lifetime, as they’re expected to simply fall apart, be torn down and rebuilt as something new. That’s why there’s no home improvement stores like Home Depot or Lowes in Japan. Almost no one will want to move into an older home/apartment, so typically they’re bulldozed and a new home/apartment is built in its place. Some economists have placed a lot of Japan’s long running economic “stagflation” on a combination of both the shrinking population and the steady devaluation of existing housing stock. Also, I believe in Tokyo, you can’t register your car unless you physically own a private parking spot (and free street parking is nonexistent). 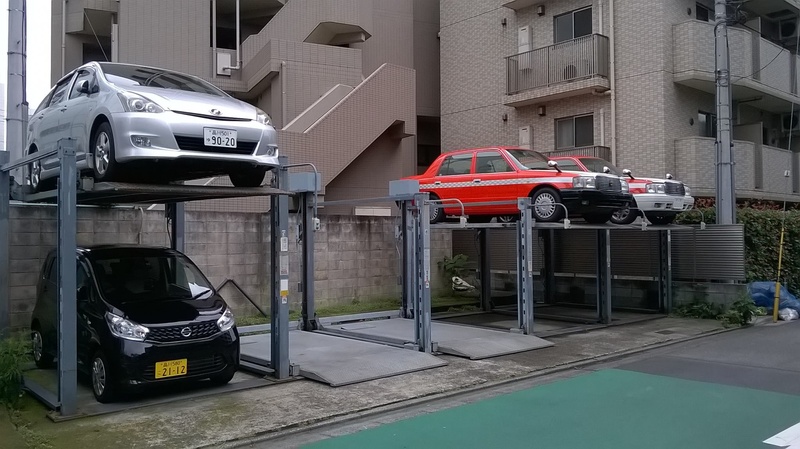 When visiting Japan last year, I noticed these novel parking solutions while walking around several neighborhoods and snapped this photo.